Need more room to store all of your bowling accessories? Try the KR Royal Flush Accessory Bag! 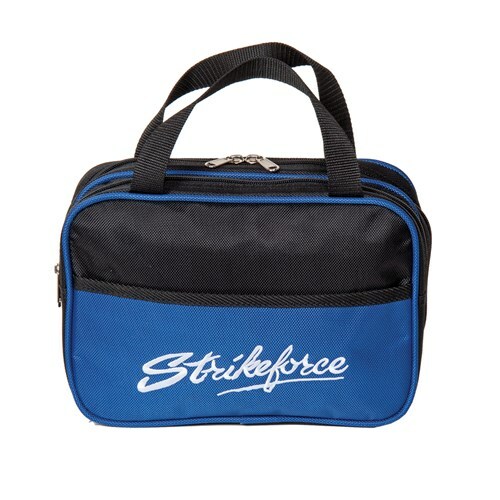 This accessory bag complements the Royal Flush line of bowling bags, but is perfect for any bowler. Will the carrying handle fit over the handle of a roling bag? Hello. The KR Royal Flush Accessory Bag is made for accessories only. It was not designed to fit over the handle of a roller. will the kr royal flush accessorie bag fit inside the storm string backpack? and is it big enough to hold accessories like an extra glove towel and grip sack? It might be a bit too large to fit inside a string backpack. The accessory bag is big enough to hold gloves, towels, tapes, inserts, grip sacks, you name it. Due to the time it takes to produce the KR Strikeforce Royal Flush Accessory Bag ball it will ship in immediately. We cannot ship this ball outside the United States.